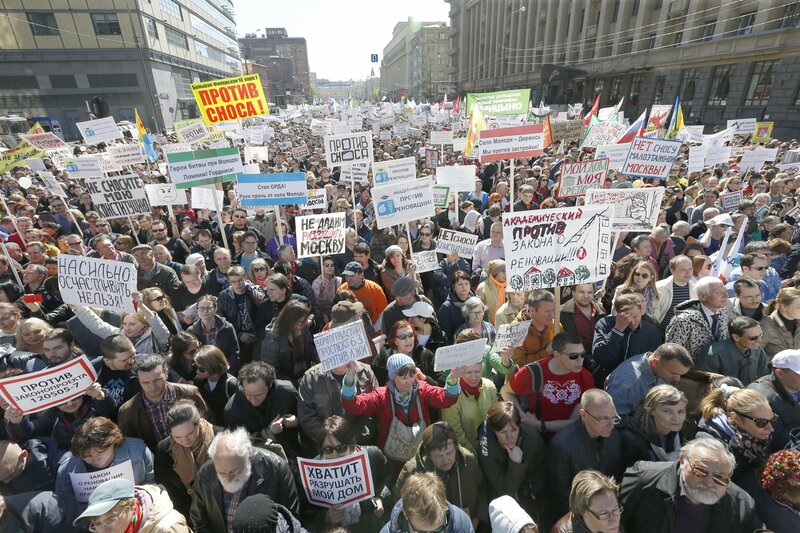 Until recently, Elmira Shagiakhmetova, a businesswoman in Moscow, had never been to a protest. But on May 14, she and tens of thousands of middle-class Russians took to the streets to defend something very precious to them—their homes. Moscow authorities plan to demolish at least 5,000 apartment blocks and rehouse around 1 million people in multistory residential towers. It’s one of the largest ever resettlement programs in the world. Under legislation proposed by Moscow Mayor Sergei Sobyanin, a member of President Vladimir Putin’s United Russia party, residents of buildings slated for demolition will have no choice when it comes to their new apartments, and if they do not agree to move, they will be taken to court. The impending program, critics say, has troubling implications for the future of property rights in Russia and has sparked widespread fury. “Why the hell would I want to move from the home that I’ve lived in my whole life to the 22nd floor of some badly constructed, hellish anthill?” Shagiakhmetova, who lives in a well-constructed apartment block a short drive from Moscow’s iconic Gorky Park, tells Newsweek. Many Moscow residents also are concerned because the legislation allows developers to sidestep regulations governing safety and ecological standards for residential buildings. It also would enable authorities to declare whole districts “renovation zones,” where any building can be demolished. People also fear they could be rehoused in areas far from public transportation. Sobyanin says the demolitions are needed to upgrade Moscow’s housing stock, but disgruntled residents allege the action is designed solely to enrich government-linked property developers and corrupt city officials. The authorities dismiss those accusations. “This law is a crime!” an elderly man shouted at a public meeting between city officials and hundreds of residents of central Moscow on May 15. Attendees ignored pleas from officials for calm. “Don’t you dare tell me to be quiet!” yelled a middle-aged woman, drawing sustained applause. Both Putin and Sobyanin are up for re-election next year, and the resettlement program, dubbed “a deportation program” by its opponents, could be a problem for both politicians. Putin received only 47 percent of the vote in Moscow, the opposition’s traditional stronghold, in the 2012 presidential election, his worst nationwide return. Sobyanin narrowly avoided a second-round runoff against opposition leader Alexei Navalny when he was elected mayor in 2013, as allegations swirled that officials had rigged the vote in his favor. Related: Is Navalny Putin's kryptonite? 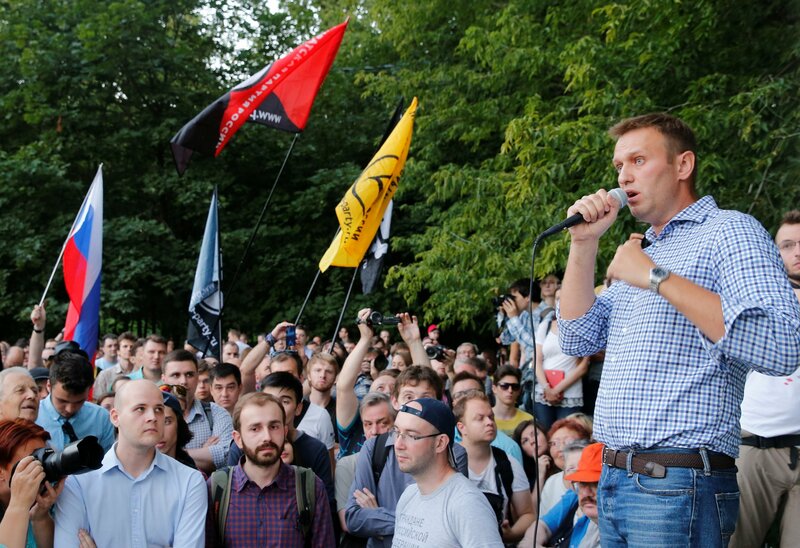 Is Alexei Navalny the Kremlin's Kryptonite? The majority of units slated for demolition date from the 1950s, when Soviet leader Nikita Khrushchev ordered a colossal construction project that would provide millions of Russians with their own apartments for the first time. For Soviet citizens who had grown up in crowded communal homes, with shared bathrooms and kitchens, the project was wonderful. “The whole apartment is ours, ours! The kitchen too is ours, ours! Our windows and our doors! I can’t believe my eyes!” sang the blissful main characters in a 1962 Soviet musical as they marveled at their new home. Though many of the first wave of apartments—dubbed Khrushchevki by Russians—were built with cheap materials and meant to last only 25 years, others were built more sturdily and designed to last up to 150 years. Indeed, thousands of the apartment blocks that authorities want to demolish were constructed with brick and concrete and remain in good condition. “The mayor has not provided enough evidence that all or even a significant number of these five-story apartment blocks are in a dilapidated or even hazardous condition,” Yury Yekhin, a prominent member of the Union of Architects, told Russian media in May. Paradoxically, some residential buildings that City Hall has officially deemed hazardous have not been included in the list of blocks to be demolished. The authorities have moved swiftly to mollify residents’ concerns. Parliament has postponed the second reading of the law, originally scheduled for late May, until July. Putin, who has publicly backed the legislation, also appears to be concerned by the strength of the grassroots movement against the project. On May 4, he said, “Nothing should be forced upon people, and their rights should be fully respected.” Moscow City Hall subsequently vowed that no apartment buildings would be demolished unless a majority of residents were in favor, and it set up an electronic voting system. Critics, however, say the vote will be easy for authorities to manipulate. Under the rules governing it, a failure to register and vote will be counted as a ballot in favor of the demolition project. On May 15, officials said that 20,000 people had already voted, and not a single person was against the project—an announcement widely mocked by the project’s critics. “The authorities are turning people against them,” says Vladimir Krasilnikov, a former journalist, during an interview in the north Moscow apartment that is home to three generations of his family.